Baby Dinosaur's 99 Million-Year-Old Tail, Encased In Amber, Surfaces In Myanmar : The Two-Way Millions of years ago, a dinosaur about the size of a sparrow had a bad day. It got stuck in tree resin. Paleontologists recently came across the rare amber fossil containing its tail in Myanmar. 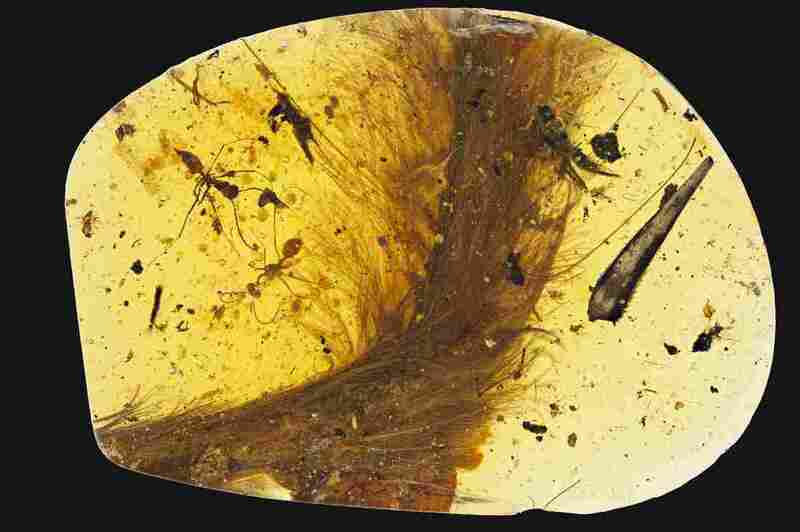 A baby dinosaur's tail is encased in amber along with ants, a beetle and plant fragments. After analyzing the delicate tail, Xing and his colleagues in China, the U.K. and Canada now have an idea of what type of dinosaur it is, and of the evolutionary clues it holds. Their research was published Thursday in the journal Current Biology. They say that 99 million years ago, a baby dinosaur about the size of a sparrow got stuck in tree resin and never made it out. Had the young dinosaur had a more auspicious day, it would have grown up to be a little smaller than an ostrich. The young coelurosaur, nicknamed "Eva," is closely related to iconic meat-eaters Tyrannosaurus rex and Velociraptor, which chases the kids around the kitchen in Jurassic Park. "A lot of baby birds look kinda creepy, to be honest. This one was probably fairly cute and fuzzy. Not your terror-of-Jurassic-Park type," says Ryan McKellar, curator of invertebrate paleontology at the Royal Saskatchewan Museum in Canada and a co-author on the paper. The tail's dense feathers spread off to the sides, making it look flat. Vertebrae the size of grains of rice allowed the animal to swing it around (the curving tail was a major tip-off for Xing that this was no bird; the vertebrae of modern birds are fused into a rod). "So it's a tiny, whip-like tail," says McKellar. It's rare to find fossil feathers attached to the spine they came from, which is what allows paleontologists to pin them firmly on the evolutionary tree. "It's a spectacular little glimpse," McKellar says. "It gives us, basically, a pathway that gets us to modern feathers." And the story of how feathers evolved has been an area of debate for some time now. People have been mining amber in northern Myanmar for at least 2,000 years. The amber there has been found to contain traces of life from millions of years ago. Bird feathers today have a strong central shaft — the part you'd dip in ink if you were using a quill. Little branches stem from that shaft, and even tinier branches stem from those, acting as hooks that zip the feather together into one smooth, continuous surface that's important for flight. Before the advent of the strong shaft and hook-like barbules, flight wouldn't have been possible. Did feathers start out stiff and spiky, with the strong shaft coming first, then the branches and then the smaller branches? Or did feathers start out floppy and fluffy, with barbs and barbules, and develop the strong central shaft later? The little creature in amber points to the floppy scenario. "It has those really fine branches, which potentially suggests the barbules evolved earlier than we thought," says Jakob Vinther, a paleobiologist at Bristol University in the U.K. who was not involved in the study. "And that actually becomes really interesting in the evolution of color," he says. Anytime you see a bird with iridescent feathers, such as a hummingbird or peacock, it's the barbules that are responsible for the brilliant, color-shifting effect. So when dinosaurs and birds evolved barbules, they unlocked a palette of brilliant colors. Earlier fossils suggest that feathers developed first for insulation. Then, one line of thinking goes, they developed for flight and then later for display — like showing off fancy colors to attract mates, or muted tones to camouflage. "I think the fact that the finest branches, which could have harbored this bright iridescence, got established before we got very robust feathers — that could potentially lean toward this idea that feathers were mainly used to show off before they got used to fly with," Vinther says. "The fact that barbules might have originated earlier clearly show that some of these very bright colors, like this metallic iridescence, could have originated earlier," he adds. "Perhaps a greater number of dinosaurs, and more primitive dinosaurs, could have been iridescent." And that means that feathered dinosaurs — even ones way back in evolutionary history — might have pranced around looking quite flamboyant. "I'm really looking forward to see what's gonna be unearthed [in Myanmar] in the future," Vinther says. "It's really exciting what we get out of these amber fossils." In fact, Xing has already been back to Myanmar. "The conflict between government forces and local armed forces is nearing an end. 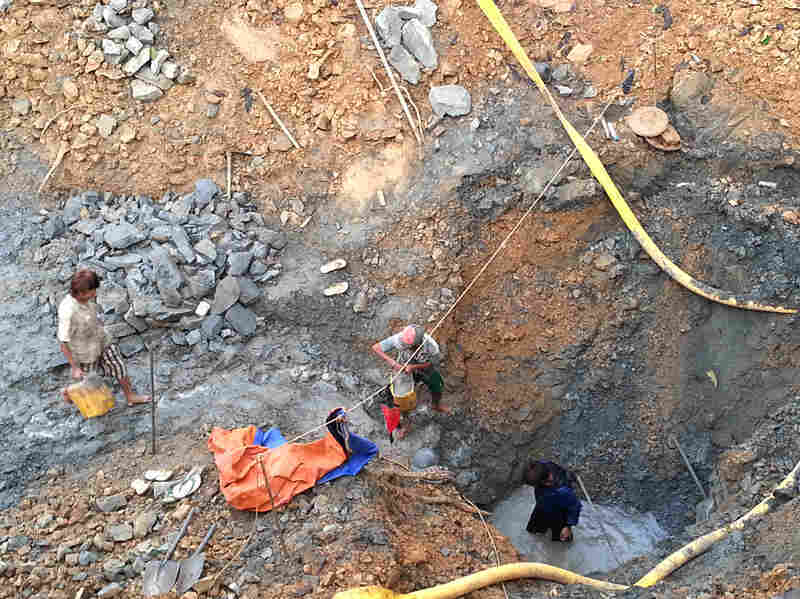 Soon, there will be a lot of specimens excavated," says Xing, who has been visiting amber markets in Myanmar's tumultuous Kachin state for a few years now. In his dream of dreams, Xing says, he hopes to find a whole dinosaur encased in amber.